​Get ready to feel great! ​Enjoy natural holistic treatments of your choice! Enjoy training workshops & Pamper Parties too! ​​ We provide a variety services, Reflexology and Massage Cupping Therapy & Holistic Treatments for the entire family! Offering an onsite & traveling Reflexologist & Massage Cupping Therapist. 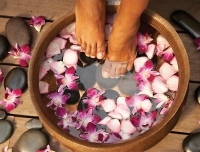 We offer Reflexology & Massage Cupping workshops, seminars & special event services. Our goal is to make you healthy & happy and a believer in holistic therapies!